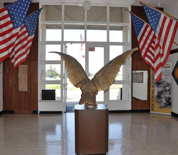 Los Alamitos Army Airfield, also known as JFTB Los Alamitos, is located in Orange County, California. It is home to the headquarters of the 40th Infantry Division which commands the 29th, 41st and 79th Infantry Brigade Combat Teams, the 81st Armored Brigade Combat Team and the Combat Aviation Brigade. Every year, the base hosts the Los Alamitos "Race on the Base" charity race, the largest reverse triathlon event in the country. This JFTB Los Alamitos directory features the critical info you’ll need to navigate through the many facilities and recreational opportunities available on base.